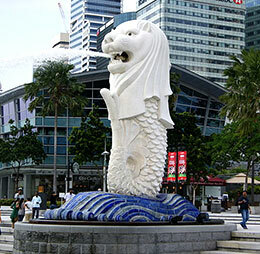 A city-state in Southeast Asia, Singapore is one of the most successful areas in the world. Singapore combines the big-city elements of skyscrapers, subways and bustling streets with traditional Chinese, Indian and Malay food, culture and goods. An all-inclusive city, Singapore is diverse enough to please anyone of any age and background. Book your Singapore flight tickets at Rehlat – One of the fastest growing online travel companies in the Middle East, and save big on your flight bookings. Hassle free journey guaranteed. The city's many old buildings and well-presented museum displays bring history to life. Chinese and Hindu temples and Muslim mosques welcome curious observers to discover their culture as they play out their daily activities, and the country's natural parks make the great outdoors easily accessible from even the most urban neighborhood. Most attractions are situated within the heart of the city, and those that lie outside the urban center are easily accessible. In Singapore, shopping is a sport, and from the practice glide through haute tailoring boutiques to skillful back-alley bargaining, it's always exciting, with something to satiate every pro shopper's appetite. The focal point of shopping in Singapore is Orchard Road, a very long stretch of glitzy shopping malls packed with Western clothing stores, from designer apparel to cheap chic, and many other mostly imported finds. As the shopping malls developed, they brought hip styles into the reach of everyday Singaporeans, adding a cosmopolitan sheen to Singapore style. Singapore claims estimated 2,000-plus eating establishments, so you'll never go hungry. But to simply say, "If you like food, you'll love Singapore!" doesn't do justice to the modern concept of eating in this city. You will find a huge selection of local, regional, and international cuisine, served in settings that range from bustling hawker centers to grand and glamorous palaces of gastronomy. The food is authentic, and many times the dining experience is entertainment in its own right. Cosmopolitan Singapore has a small but well-developed nightlife, with a clubbing scene that has earned international attention and a burgeoning arts scene that delights audiences nightly with world-class music and theater performances. Singapore has a wide range of transportation, from streetcars to funicular railway. You can wander across the city through these public transportations; however taxis and cars will be expedient way to explore the city. Visitors can also travel using local trains. Singapore Changi Airport or simply Changi Airport is the primary civilian airport for Singapore, and one of the largest transportation hubs in Southeast Asia. It is currently rated the World's Best Airport by Skytrax for the fifth consecutive year and is one of the world's busiest airports by international passenger and cargo traffic. The airport is located in Changi, at the eastern end of Singapore. It is operated by Changi Airport Group and it is the home base of Singapore Airlines, Singapore Airlines Cargo, SilkAir, Scoot, Jetstar Asia Airways and BOC Aviation. Take public bus service 36/36A to the city. The first bus arrives at around 6.00am and the last leaves just before midnight. A single fare is estimated to cost around $2.50 and the ride takes about an hour. Bus stops are located at the basement bus bays of Terminals 1, 2 and 3. Please prepare the exact fare as no change will be given. Public buses stop at Terminals 1, 2 and 3. A single fare from the city via public bus service 36 is estimated to cost around $2.50 and the ride takes about an hour.